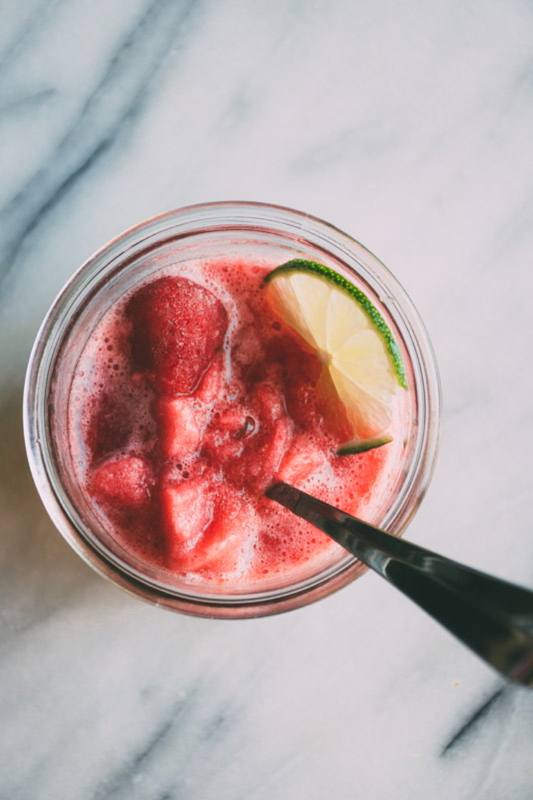 one of the things I like the most about summer in the kitchen is working on recipes for tasty icy + healthy beverages! 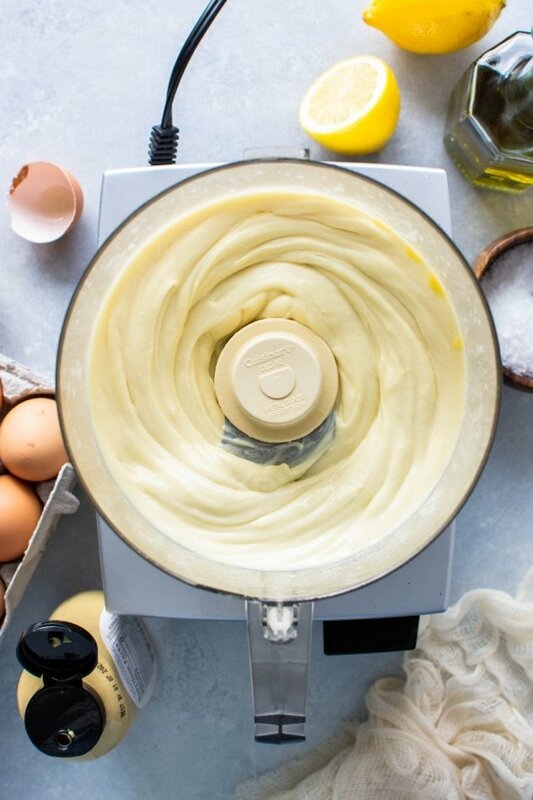 it seriously makes me so happy to whip up something that is guilt free, good for you, and makes you feel a bit like a kid again with all its frozen goodness. 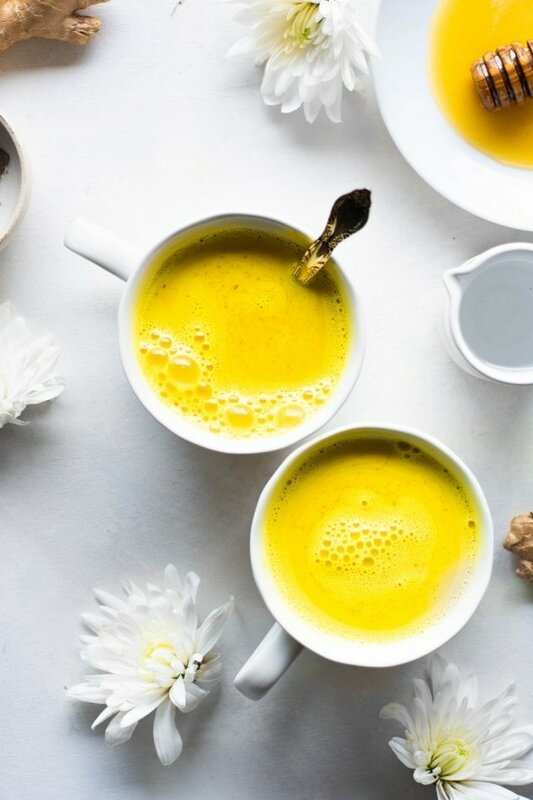 this recipe is pretty simple, made with only 4 ingredients, and free of refined sugar and dairy. 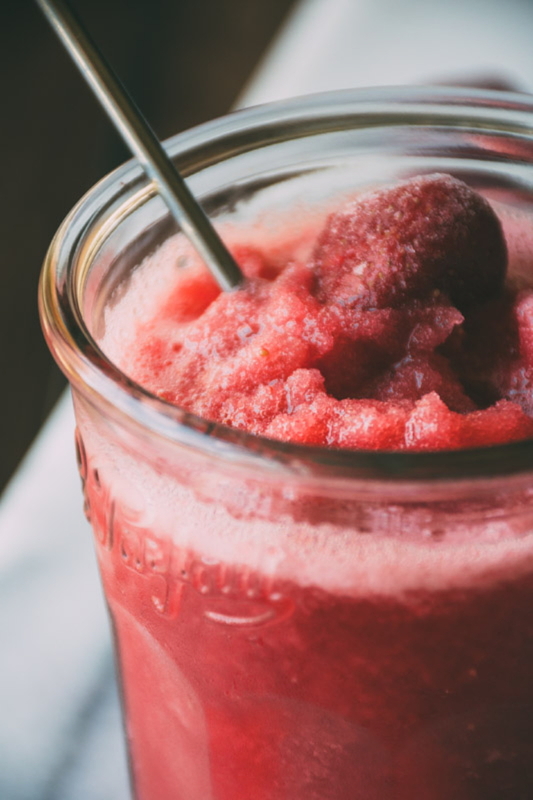 it’s slightly sweet, cold, frosty and full of juicy strawberry flavor ( ripe red berry goodness ) with just a hint of lime added in to brighten up all the flavors even more. I think you’ll find plenty of excuses to make it throughout the warm summer days. 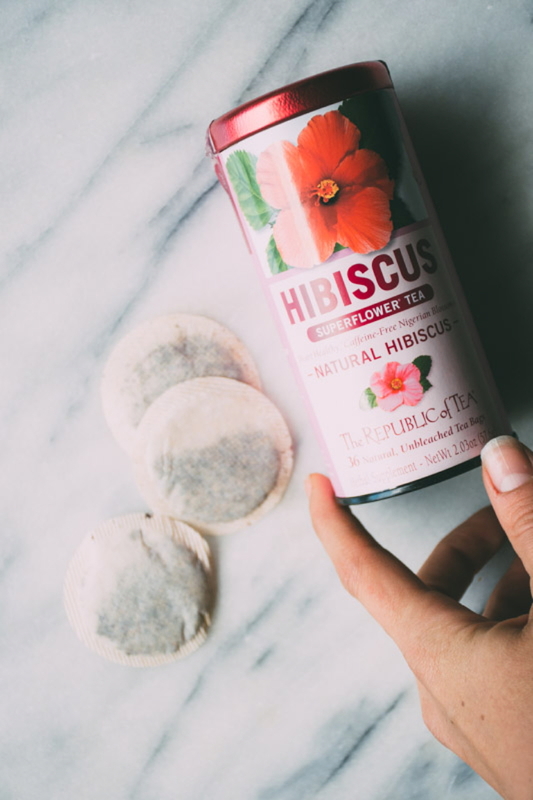 the base of the slushy starts with hibiscus tea lightly sweetened with honey. 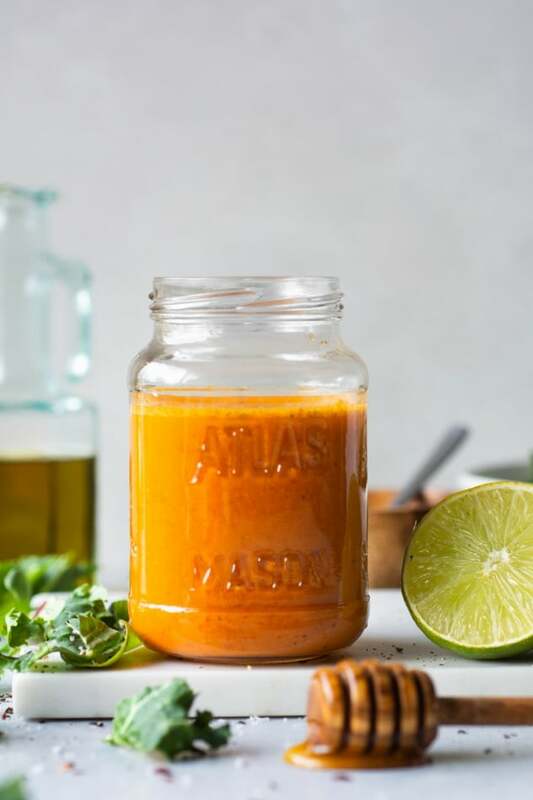 I made a batch of about 6 cups, which ends up being a little more than you’ll use for the recipe but it’s so delicious I don’t think you’ll mind having some extra in the refrigerator. 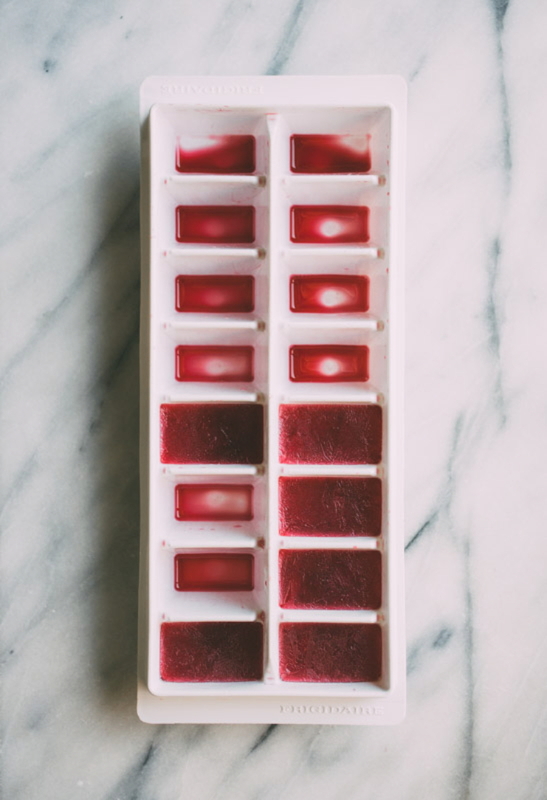 half of the honey sweetened hibiscus tea will be frozen into ice cubes, so there is a little bit of advanced planning involved – but nothing that takes more than about 10 minutes to prep. I made mine the night before so they had a chance to fully freeze but if you’re short on time 2-3 hours would probably be sufficient. 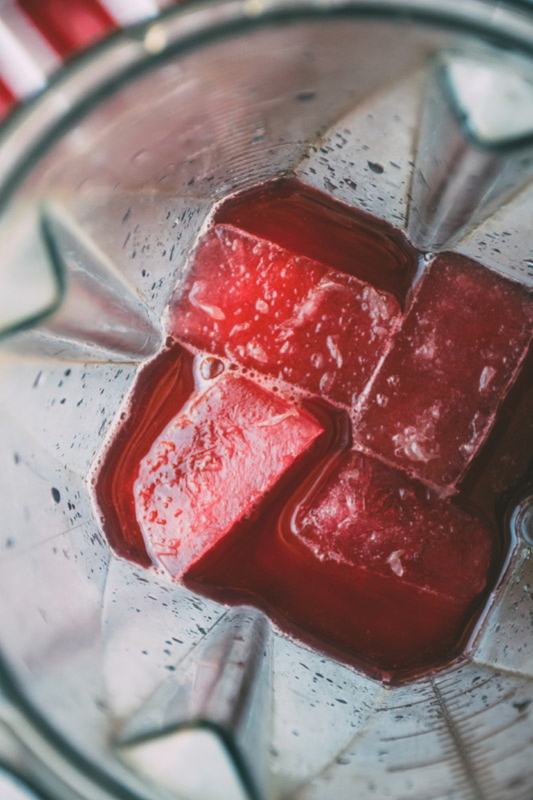 once the ice cubes are frozen you can make your hibiscus strawberry slushy. 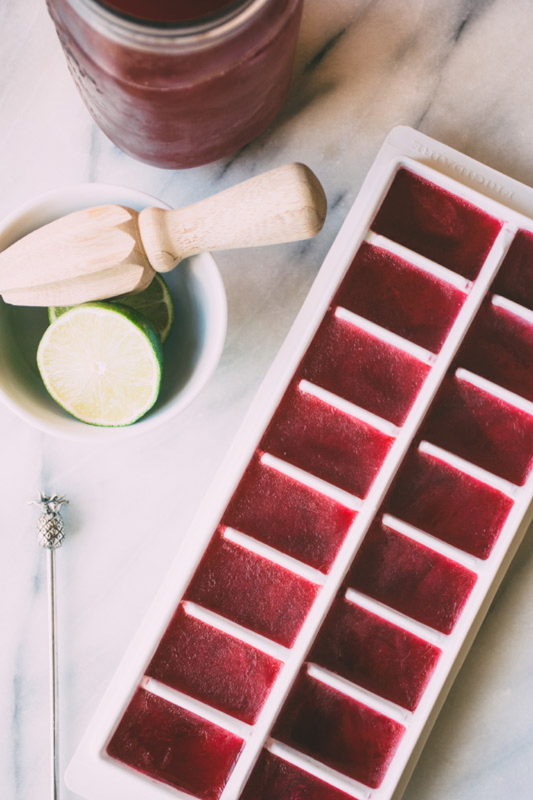 a bit of the chilled hibiscus tea is added to the blender along with some of the frozen hibiscus cubes, a big squeeze of fresh lime and one cup of frozen strawberries. 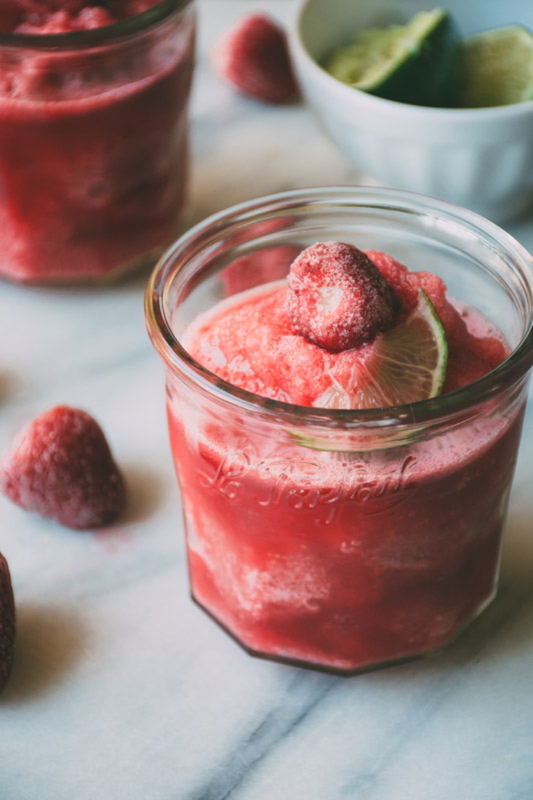 the strawberries could easily be swapped out for another frozen berry for an alternate flavor! 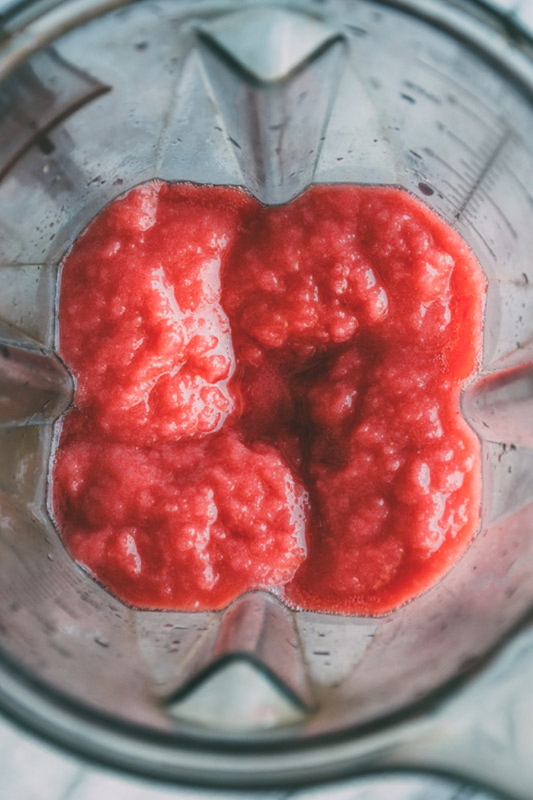 hibiscus strawberry slushies! 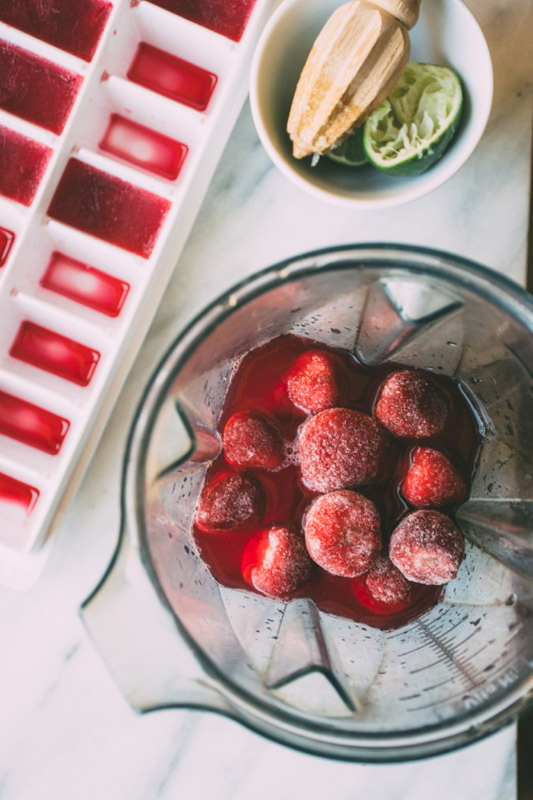 an easy frozen drink recipe made with honey sweetened hibiscus tea, frozen strawberries and fresh lime juice. 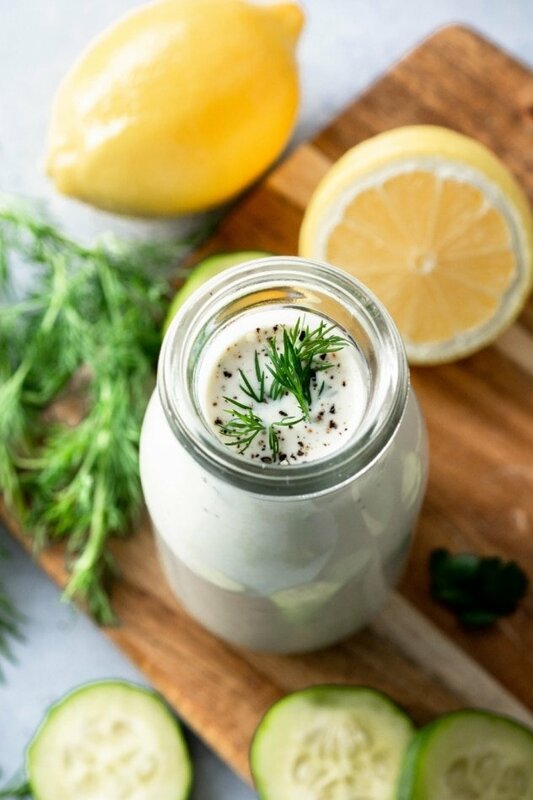 perfect to enjoy during the warm months of summer! steep tea bags in hot water with honey until cooled to room temperature. fill one ice cube tray with tea and freeze. store the rest of the tea in the refrigerator until ice cubes are frozen. 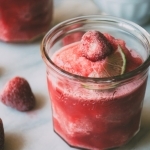 add 1 1/2 cups tea, 10 hibiscus ice cubes, lime juice and frozen berries to blender and blend until smooth, using the tamper to get things moving (if you have one), and adding more tea a little bit at a time of necessary until desired texture is reached. 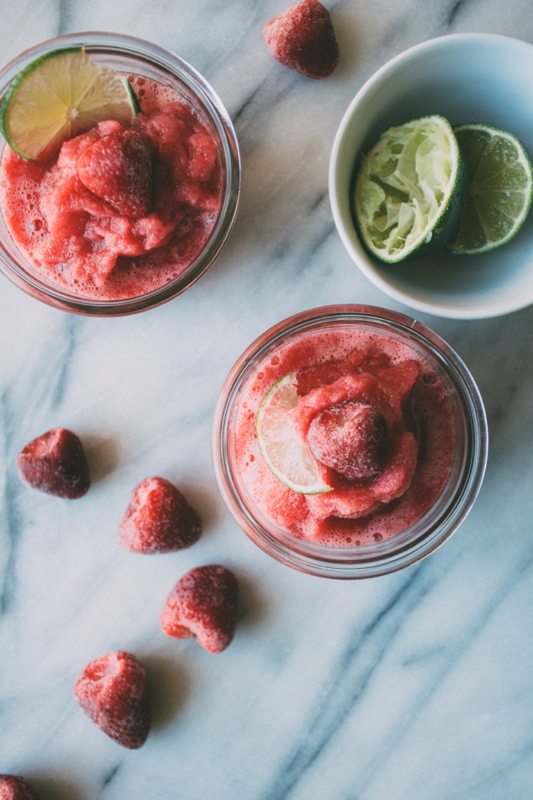 pour into 3 – 4 glasses and serve topped with frozen strawberries and lime slices for garnish! 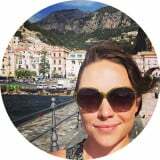 This entry was posted in drinks, sweets and tagged drink, easy, gluten free, quick, refined sugar free, vegan, vegetarian on June 26, 2016 by Nyssa Tanner.